Coffee connoisseurs who prefer a smooth, rich and full-bodied coffee flavour will love the new KitchenAid® Cold Brew Coffee Maker. As coffee drinkers continue to explore home brewing, this no-heat method has gained popularity, requiring a slow extraction to produce a low-acid, flavourful concentrate. 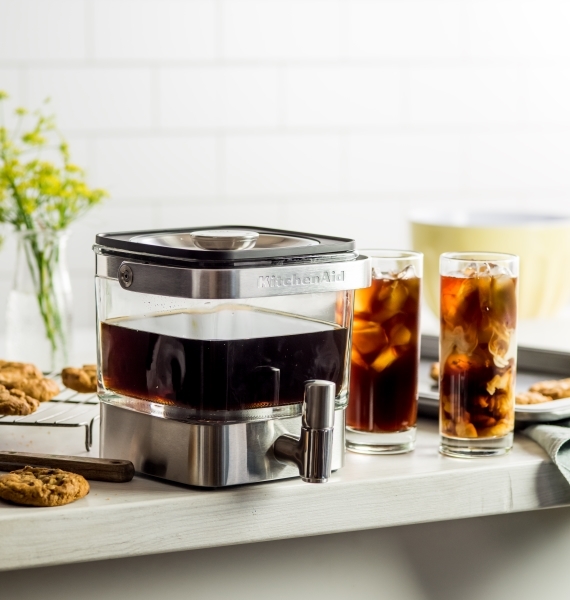 The KitchenAid® Cold Brew Coffee Maker is not only for coffee, it’s versatility allows you to brew tea, cocktails, fruit infusions and more. The glass and stainless steel body preserve taste and are easy to clean, which means you can brew coffee one day, and fruit infused water the next with no flavour transfer. Brew up to 14 servings (828ml capacity) of concentrate, with a small footprint, you can keep your KitchenAid® Cold Brew Coffee Maker in the fridge for up to two weeks. The concentrate can be enjoyed with milk, over ice, and other mixes, giving the consumer variety with their day-to-day coffee ritual. The KitchenAid® Cold Brew Coffee Maker, as easy as steep, pour and enjoy. Visit www.kitchenaid.com.au/cold-brew-coffee-maker to find out more, RRP$199.